What Does The Green New Deal Have In Common With The United Nations’ Solutions To Global Warming? Yesterday Investor’s Business Daily posted an editorial about the Democrat’s Green New Deal. Oddly enough, when you look at the consequences of the policies of the Green New Deal, they have a lot in common with ideas espoused by the United Nations. The motives of both are somewhat questionable. Let’s compare that to the Green New Deal. Reading the Green New Deal (GND) plan, put out Thursday by Rep. Alexandria Ocasio-Cortez and Sen. Ed Markey, one is tempted to think it’s not real, just a joke from the satirical “The Onion.” The individual planks in the plan, individually and collectively, sound like the rantings of someone who should be institutionalized, not like a rational political plan to solve a real problem. We hope he’s right, and America’s declining education system and the increasingly far-left mainstream media have’t made socialism a palatable choice against the extraordinary success of the free market. Socialism is among humanity’s worst ideas and it has failed everywhere — everywhere — it has been tried. Those who don’t think the socialist disaster of Venezuela can happen here are sadly — tragically — mistaken. It should never be tried again, anywhere, but especially not here. They idea that a country can prosper by guaranteeing everyone a comfortable standard of living whether they choose to work or not goes against human nature. Prosperity comes from achievement, and achievement is generally spurred on by the rewards it receives. If hard work is not rewarded, there will be no great achievements. It’s that simple. Yesterday The Washington Post posted an article about some new information on climate change and rising oceans. The facts simply do not support the idea of the catastrophic sea-level rise that those who practice the religion of global warming have predicted. In her latest paper, Ms. Curry (Climatologist Judith Curry) found that the current rising sea levels are not abnormal, nor can they be pinned on human-caused climate change, arguing that the oceans have been on a “slow creep” for the last 150 years — before the post-1950 climb in carbon-dioxide emissions. “There are numerous reasons to think that projections of 21st-century sea level rise from human-caused global warming are too high, and some of the worst-case scenarios strain credulity,” the 80-page report found. Her Nov. 25 report, “Sea Level and Climate Change,” which has been submitted for publication, also found that sea levels were actually higher in some regions during the Holocene Climate Optimum — about 5,000 to 7,000 years ago. Such conclusions are unlikely to find favor with the global-warming movement, or within the academic climate “consensus,” where some experts have predicted that mean sea level could rise by five to 10 feet by the end of the 21st century. She said she doesn’t believe her findings on sea-level rise are particularly controversial, saying that they jibe with those of the U.N.’s Intergovernmental Panel on Climate Change. Ms. Curry left academia in January 2017 for a host of reasons, one of which was the “craziness” associated with the politics of the climate-change debate. She moved to Reno and has since devoted her energies to her company, Climate Forecast Applications Network. Given that nobody wants to be labeled a “denier,” what does she prefer to be called? That’s an easy one. Maybe at some point we can end the hysteria and get back to science. The Daily Signal posted an article today about the new Climate Report presented to President Trump. The article notes that the study was partially funded in part by climate warrior Tom Steyer’s organization. How is this supposed to be an objective study? The study…calculates these costs on the assumption that the world will be 15 degrees Fahrenheit warmer. That temperature projection is even higher than the worst-case scenario predicted by the United Nations Intergovernmental Panel on Climate Change. In other words, it is completely unrealistic. Climate change has been with us as long as the earth has existed–they found plant fossils under the ice in Greenland. The question is, “How much impact does man have on climate, and do we have the ability to impact climate in a positive way?” Considering some of the mistakes we have made in the past when tampering with nature, I truly believe we need to attempt to keep our air and water as clean as possible and leave the rest to nature. The National Review is reporting today that some climate scientists have discovered a significant error in their recent calculations of rising ocean temperatures. I am not yet convinced that man is responsible for any global warming that may be occurring–cyclical climate change has been a part of the earth’s existence since the earth existed. I do believe that we have a responsibility to limit pollution as much as possible, but I don’t believe we are significant enough to interfere with the earth’s cyclical climate changes. On Friday, The Daily Caller posted an article about Al Gore’s latest comments on global warming. Any relationship between Al Gore’s comments and actual reality is purely coincidental. Some of his more famous predictions, including that Mount Kilimanjaro would have no snow by 2016, were hilariously incorrect — and, yes, Kilimanjaro still has snow. 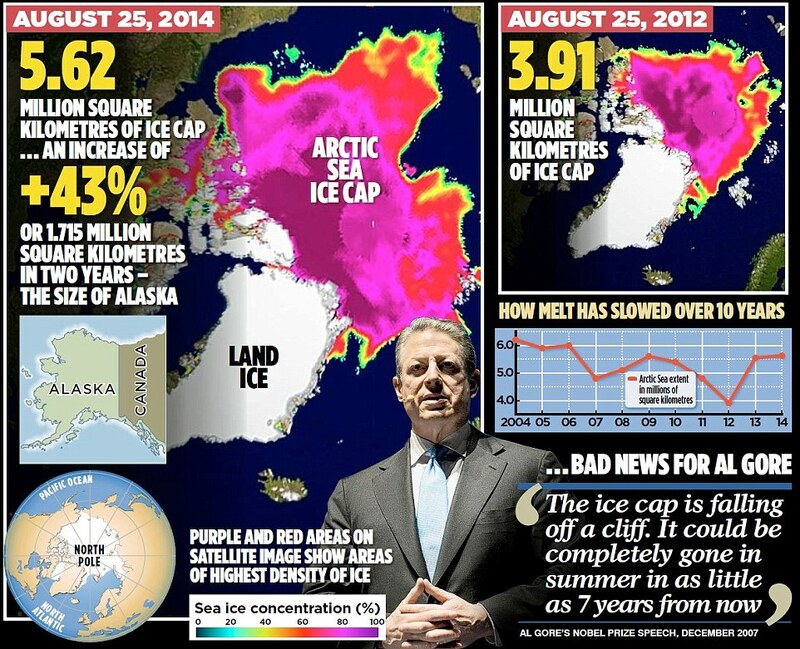 Five years ago at a UN Conference on Climate Change, Al Gore predicted that, global warming having reached such an unbridled pitch, the North Pole might be completely ice-free during the summer of 2014. …The Danish Meteorological Institute‘s (DMI) Centre for Ocean and Ice closely monitors Arctic sea ice extent and publishes a monthly plot on its website. According to DMI, 2014 is the second summer in a row that the ice cap has expanded. Data from the U.S. National Snow & Ice Data Center (NSIDC) agrees, showing 2014’s summer ice well within the average range for the years 1961-2010. In fact, NSIDC’s website points out an ice extent decline rate of “slightly less than the average” for the month of August. To understand what the hype about global warming and carbon footprints is really about, all you need to do is follow the money. Unfortunately for those who tried to sell the climate change scam to Americans, the money hasn’t been what it was expected to be. In 2009, The Canada Free Press ran an article about the funding and financial connections found in the Chicago Climate Exchange. The Chicago Climate Exchange was supposed to play a major role in the American economy once Congress passed cap-and-trade legislation that would regulate carbon emissions and grant carbon credits. The legislation did not pass, and the Chicago Climate Exchange closed in 2011. Many Democratic Congressmen lost large amounts of money when the Exchange closed–they had made investments figuring they could pass cap-and-trade legislation. If you follow the link to The Canada Free Press article, you can find out who was in on the scam and how it was supposed to work. There is an article on the closing of the Exchange in The New York Times in January 2011. I can almost guarantee that if a Democratic majority is elected in Congress in the near future we will see the Exchange magically reappear with as much corruption as was involved in its original founding. The story of the Chicago Climate Exchange is only one example of how Congressmen who do not have principles will make investments that will benefit from legislation they plan to pass. That is not the way our government is supposed to work. The website that I strongly recommend for accurate, scientific information on climate is wattsupwiththat.com. Yes, it has happened. The political left has finally found a war it is wholeheartedly willing to fight–no holds barred–they even want to draft Americans to fight it. So what is that war? Investor’s Business Daily posted an article today about a war the political left wants to fight. The political left is ready to go to war, but not against any real threat. It wants to fight global warming — and of course that will require Americans to make sacrifices that just happen to align with the left’s objectives. Al Gore popularized the phrase “fighting global warming” to underscore what he thinks is the seriousness of the matter. Though profoundly childish, the expression caught on and apparently inspired a Seattle-based writer to lay out in the Atlantic a plan for war. According to Venkatesh Rao, “solving global warming” is going to be “like mobilizing for war.” And of course, war requires us to give up some things in the name of the effort. In this wartime, Rao is also demanding trust in “academic and energy-sector public institutions” as well as in “the integrity and declared intentions of institutions” that understand “the intricacies” of climate science. Nevermind the false data that has been used to show climate change, never mind the growing ice caps that contradict the panicked claims of global warming. We have become so arrogant that we believe that we can control the climate outside and inside. Wow. I would like to point out at this point that I support efforts made to make air and water cleaner. I support efforts to maintain the earth and correct previous mistakes made that had a negative impact on the environment,. However, I also believe that crippling the free market system (or what is left of it) in the world will simply cause more poverty, more pollution, and more misery. That is something I simply cannot support. Unfortunately in recent years, science has become political. Scientists are not stupid people, and they figured out rather quickly that it is easier to get grant money if you say a crisis of some sort is imminent. The global warming alarmists are a prime example of this. The other part of the story is that if politicians can convince everyone that global warming is man-made, they can use it to control the economies of the major countries of the world. Also, countries that are not economically successful can use the idea of global warming to blackmail countries that are wealthy. All that needs to happen is that the numbers have to be cooked enough to be believable. Well, guess what? The evidence that the temperature numbers are being cooked is piling up. Herman Cain posted a story on his website today about three countries that have been altering their temperature numbers. In previous editions of Climate Change Weekly (CCW), I reported weather bureaus in Australia (CCW #139) and Paraguay (CCW #158) were caught adjusting datasets from their temperature gauges. After the adjustment, the temperatures reported were consistently higher than those actually recorded. Science journalist Markus Schär of the Swiss news weekly Weltwoche discovered the Swiss Meteorological Service (SMS) tampered with its datasets as well. In light of significant urbanization resulting in an expanded heat island effect near many temperature gauges, Schär argues the adjustment of raw data to report higher temperatures than are actually measured is unjustifiable. “The corrections … appear so massive that they represent half of the entire temperature increase,” said Schär. Even with fudged data, governments have been unable to hide the fact winters in Switzerland and in Central Europe have become colder over the past 20 years, defying predictions of the Intergovernmental Panel on Climate Change (IPCC) and other climate alarmists. When the government comes calling for more of your money in order to fight global warming, it might be a good time to remind them that global warming is not happening. The best site on the internet for scientific information about climate change and what is true and what is not is wattsupwiththat.com. I strongly recommend it. A lot of people have lost faith in the mainstream media as a source of information. Many of my friends have cancelled their subscriptions to various newspapers. So what is going on? The Internet has given people a chance to do their own research and draw their own opinions. One example of media hype of something that is questionable at best is the way the media has handled the concept of man-made global warming. Despite little scientific evidence to support the claim, our government is shutting down power plants, causing the price of utilities to rise, and trying to control the lives of the American people in ways our founding fathers never intended. Yesterday John Hinderaker at Power Line posted an article with a graph showing the difference between actual global temperatures and what global warming proponents have predicted in the past. We can see below the direct comparison between 102 model runs and observations. The differences in the data are obvious. So why are many journalists and people in power trying to convince us that man-made global warming is real? Follow the money. I posted an article in 2010 (rightwinggranny.com) about the Chicago Climate Exchange (CCX). This was a carbon credit exchange heavily invested in by many political leaders. When cap and trade legislation was defeated, the CCX went out of business and many political leaders lost money. Unfortunately, the people we send to Congress are not always looking out for our interests. A picture is worth 1,000 words. This picture is from the U.K. Telegraph. They posted it on Saturday. In my opinion, the best website for honest information on global warming, climate change, etc. is wattsupwiththat.com. It is scientific, but generally things are explained in a way that those of us who are not scientifically minded can understand them. Climate change has happened on the earth since the earth began. Man is not in control of the earth’s climate. There is a very strong possibility that TIME Magazine was right when it reported in the 1980’s that we were entering another Ice Age. The only thing we can be sure of is that over time, the earth’s climate changes. 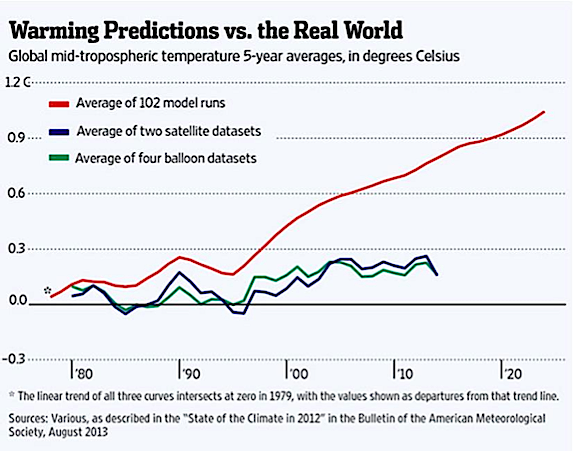 We have not yet put together successful scientific models to tell us when and how the climate is changing. We simply do not know as much as some people like to think we know. Posted in Uncategorized	| Tagged Climate change, Climatology, Earth, Global warming, Intergovernmental Panel on Climate Change, UK Telegraph, Watts Up With That? Yesterday WattsUpWithThat posted an article reminding us that despite alarmist predictions there has been a pause in global warming for 17 years 9 [months] since September 1996. That seems to me to be a rather significant pause. Figure 1. RSS monthly global mean lower-troposphere temperature anomalies (dark blue) and trend (thick bright blue line), September 1996 to May 2014, showing no trend for 17 years 9 months. Figure 2. Medium-term global temperature projections from IPCC (1990), January 1990 to April 2014 (orange region and red trend line), vs. observed anomalies (dark blue) and trend (bright blue) as the mean of the RSS and UAH monthly satellite lower-troposphere temperature anomalies. Figure 3. Predicted temperature change since 2005 at a rate equivalent to 1.7 [1.0, 2.3] Cº/century (orange zone with thick red best-estimate trend line), compared with the observed anomalies (dark blue) and trend (bright blue). If my weatherman was this far off, I’d fire him! In 1990, the IPCC’s central estimate of near-term warming was higher by two-thirds than it is today. Then it was 2.8 C/century equivalent. Now it is just 1.7 Cº – and, as Fig. 3 shows, even that is proving to be a substantial exaggeration. On the RSS satellite data, there has been no statistically-significant global warming for more than 26 years. None of the models predicted that, in effect, there would be no global warming for a quarter of a century. New attempts to explain away the severe and growing discrepancy between prediction and reality emerge almost every day. Far too few of the scientists behind the climate scare have yet been willing to admit the obvious explanation – that the models have been programmed to predict far more warming than is now likely. On Saturday, WattsUpWithThat posted an article about the Himalayan glaciers. 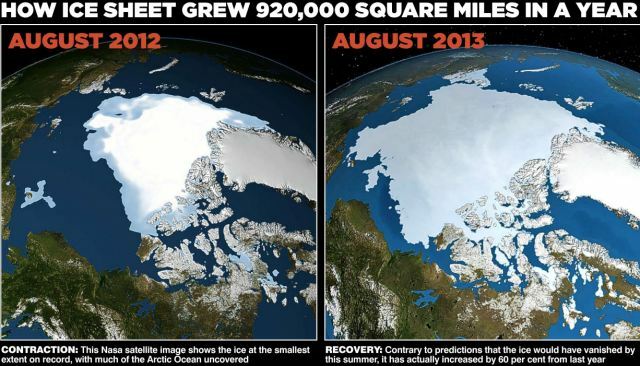 These glaciers were supposed to melt by 2035 according to the Intergovernmental Panel on Climate Change (IPCC). Well, the glaciers are simply not cooperating. Please follow the link to the article to read the details–I myself have a very unscientific brain, and the picture works better. Global warming (and cooling) are a natural process is the history of the earth. During the warming period in the Middle Ages, there were not a lot of SUV‘s around to create the problem. The current panic over global warming is simply a tool to take money away from people who have earned it in free societies and give the money to people who have not earned it in dictatorships and tyrannies. Posted in Uncategorized	| Tagged Climate change, Glacier, Global warming, Himalaya, Intergovernmental Panel on Climate Change, IPCC, Middle Ages, Watts Up With That? As a major snowstorm bears down on the northeastern United States and a bunch of scientists and tourists are stuck in unusually thick ice in Antarctica, the U.K. Telegraph proclaims that the earth is warming faster than ever. The rebuttal can be found at wattsupwiththat in an article entitled, “IPCC silently slashes its global warming predictions in the ARS final draft.” The Intergovernmental Panel on Climate Change (IPCC) has released its Assessment Reports on Science (ARS). In the second draft of the Fifth Assessment Report it had broadly agreed with the models that the world will warm by 0.4 to 1.0 Cº from 2016-2035 against 1986-2005. But in the final draft it quietly cut the 30-year projection to 0.3-0.7 Cº, saying the warming is more likely to be at the lower end of the range [equivalent to about 0.4 Cº over 30 years]. If that rate continued till 2100, global warming this century could be as little as 1.3 Cº. Unfortunately, global warming science has become more about obtaining funds for studies and about redistribution of wealth. I think when we finally look at global warming objectively (if we ever do), we will be amazed at how easily we were deceived. Brietbart.com posted a story today about the recently released report by the U.N.’s Intergovernmental Panel on Climate Change (IPCC). Because the IPCC could not explain why the earth has not warmed significantly over the past fifteen years (rising only 0.05 degrees Celsius (0.09 degrees Fahrenheit), they simply ignored the fact. There are serious questions about the scientific method behind the global climate studies. So far none of them have actually been accurate even in the short term. If you remember, the National Oceanic and Atmospheric Administration (NOAA) predicted that due to global warming, this year would be one of the most active hurricane seasons on record. Admittedly, the season isn’t over yet, but so far that prediction falls somewhat short of the mark. New England had a hot July this summer. I live in a house without central air-conditioning, and we ran between two and three air conditioners most of the month. Usually we run two for about two weeks. Well, I guess there were other places that just weren’t quite that warm. 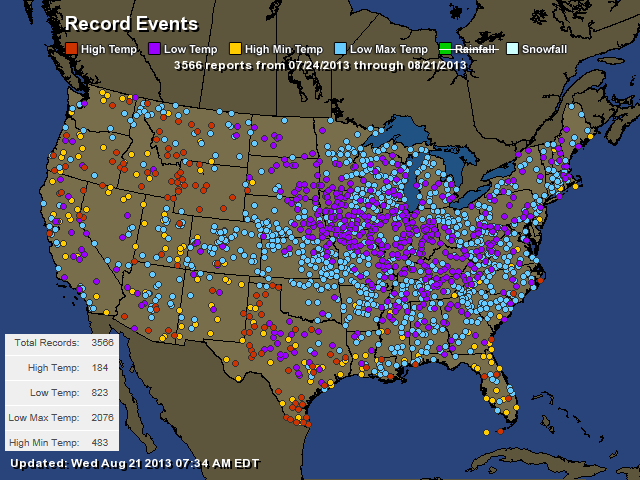 The map shows high and low record temperatures from July 24 through August 21. This was posted on their website yesterday. Meanwhile, Steven Hayward at Power Line points out that the UN’s Intergovernmental Panel on Climate Change (IPCC) will begin its battle to convince us that global warming is real and man-made within the next few weeks. The IPCC will bring out its report in three sections–Science, Impacts, and Mitigation. The Science report is due out next month. The earth’s climate goes through cycles. It has gone through cycles before man was here. Those cycles are somehow built into the way the earth works. So far we have not successfully figured out how those cycles work. In recent years the National Weather Service in America has predicted catastrophic hurricane seasons caused by global warming. We have had some severe hurricanes, but it has been a long time since we have seen a catastrophic hurricane season. The bottom line here is that we as people do not control the earth. We could give all the money we have to corrupt dictators in third-world countries, and we still would not control the earth. We need to do everything we can to keep our air and planet clean, but giving money to countries that will not spend money responsibly helps neither us or the earth. John Hinderaker at Power Line posted a story yesterday about the current draft of the report of the United Nations’ Intergovernmental Panel on Climate Change (IPCC). The draft has been leaked and contains one very interesting paragraph. I am not a scientist, and to me that paragraph is a foreign language, but Mr. Hinderaker is kind enough to explain what it means. It shouldn’t be a surprise that variations in the Sun’s output are responsible, at least in part, for variations in Earth’s temperatures. The problem is that if you simply do the math on radiant heat, the known increase in solar activity during the second half of the 20th century accounts for only a small portion of the assumed increase in temperature over that period. So the alarmists have denied that the Sun plays a significant role. More recent work has strongly suggested that solar radiation plays a role above and beyond radiant heat, by influencing cloud cover, which is a key factor in temperature. Given the strong correlation between solar activity and temperature, this work has been persuasive. The bottom line here is simple–we didn’t do it! The progress of civilization is not the major cause of global warming–the sun and the sun’s impact on cloud cover play a major role in global climate. The entire leaked report (and more scientific analysis) can be found at wattsupwiththat.com. Please take the time to look at the leaked draft before it is changed! Remember the leaked e-mails from the University of East Anglia’s (UEA) which brought into question the validity of the Intergovernmental Panel on Climate Change (IPCC)’s work, with the reported statements “hide the decline,” and “Mike’s Nature Trick.”? Remember IPCC claims that the Himalayan glaciers would melt by the year 2035, which the IPCC, in a statement, later admitted was based on inconclusive data? According to CNS News, the questionable reports of the IPCC released in recent years have been funded more than 50 percent by the U. S. taxpayers. In a Nov. 17, 2011 report, “International Climate Change Assessments: Federal Agencies Should Improve Reporting and Oversight of U.S. Funding,”the GAO found that the State Department provided $19 million for administrative and other expenses, while the United States Global Change Research Program (USGCRP) provided $12.1 million in technical support through the U.S. National Science Foundation (NSF), averaging an annual $3.1 million to the IPCC over 10 years — $31.1 million so far. This is one place we truly need to cut the budget. As a government, we are broke. We are borrowing the dollars we are spending. We also need to realize that most of the solutions proposed by the climate change proponents involve crippling the American economy while not dealing with the countries that are actually creating more pollution than the United States. It’s not about climate change–it’s about the redistribution of wealth. There is a mentality among some of those involved in climate research that the rest of the world will be made richer if America is made poorer. It never occurs to them that if they would focus on working toward building their own country’s economy rather than tearing down America’s economy, they might actually accomplish something positive. It’s time for someone in Congress to put a stop to this. On Friday, Investors.com posted an article about new information on the impact of carbon dioxide on global warming. The study’s findings are simple and devastating. “This implies that the effect of CO2 on climate is less than previously thought,” said Oregon State University’s Andreas Schmittner, the study’s main author. Even with a doubling of CO2 from levels that existed before the Industrial Revolution, the study found a likely increase in Earth’s temperature only from about 3.1 degrees Fahrenheit to 4.7 degrees Fahrenheit. That compares with the U.N. Intergovernmental Panel on Climate Change’s 2007 report, which predicted an increase of 3.6 degrees to 8.6 degrees. The latest batch of emails released by European climate-change scientists have shown that scientific data is not as important as the global-warming agenda. Happily, the left’s pernicious, economy-destroying and false global warming ideology is collapsing under a growing body of evidence that the CO2 scare is a fraud. The environmental movement as it currently exists is not about the environment. It is about redistributing the wealth of prosperous democracies to poverty-stricken third-world tyrants. The Kyoto treaty (which was supposed to control greenhouse gas emissions) expires in 2012. There is serious question as to whether or not a new treaty will follow. Yesterday John Hinderaker at Power Line posted a story about James Hansen, one of the leaders in the fight to convince the world that global warming is real and man-made. It recently came out that James Hansen, one of the two or three most prominent global warming alarmists on whose work the IPCC reports rest, “forgot” to report $1.6 million in outside income, as required by his government contracts. Is that significant? Well, yes: A handful of scientists, including Hansen, have gotten wealthy on climate alarmism. They have an enormous financial interest in the faux science they have done so much to perpetrate. Mr. Hinderaker points out that being a global-warming alarmist can be very profitable. The federal grants go to the people who claim that we are in serious danger, and the exotic speaking engagements go to the more radical proponents of global warming. There is another aspect of this that I find extremely interesting. There is a website called surfacestations.org that shows some of the locations of the temperature gauges the global warming people are using to monitor temperature changes. This is a sensor in Marysville, California. This sensor is in Hopkinsville, Kentucky. 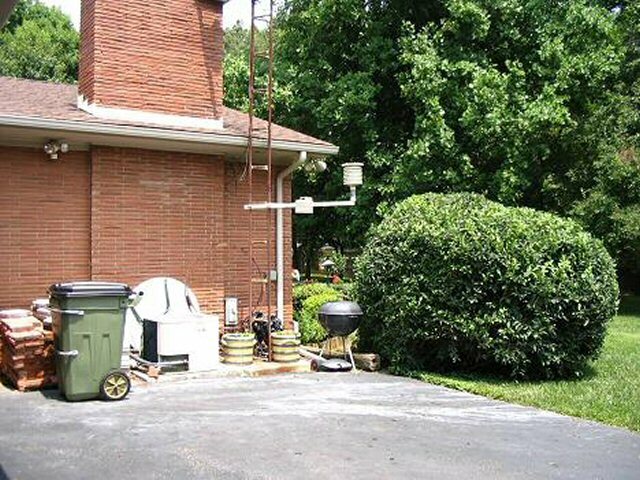 Note that it is very close to both the house and the air conditioning unit. There are more pictures available at surfacestations.org. I am probably one of the least scientific people on the planet, but even I have figured out that when you stand near an air conditioning unit, the air next to that unit tends to be a bit warmer than the air farther away. We need to understand that there are climate cycles that occur naturally. We are not in control of the climate–either in a positive or negative way.